Watch out for Grenville who will again be one of the '100' judges on the new BBC1 Saturday night series, All Together Now. This goes out in February and you may well have seen the celebrity special show on BBC1 which was broadcast on Christmas Eve. Grenville featured in the programme because he didn't stand up and press his red button for the overall winner!!! 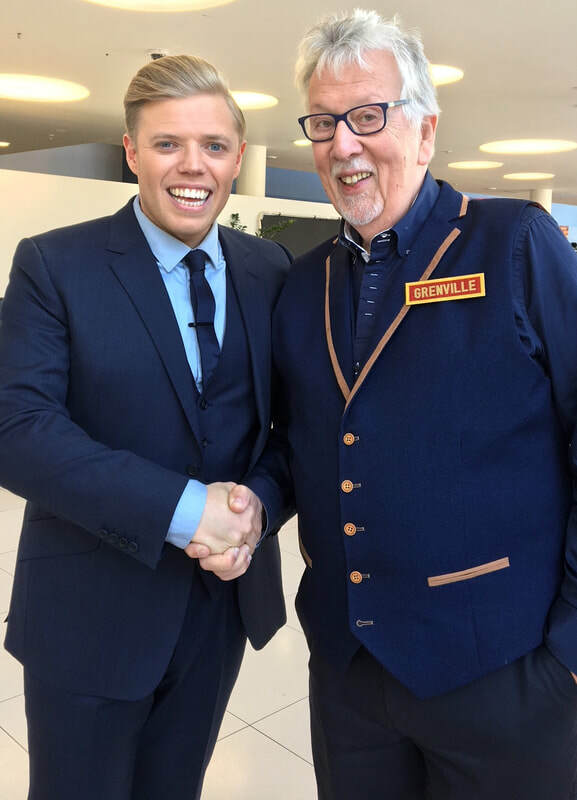 The show is presented by Rob Beckett, pictured above with Mr Jones. Philip graduated from Bath Spa University in 2008 with a BA in music. Since then, he has accompanied several choirs in and around Bath, as well as teaching the piano and music theory. He also regularly accompanies instrumental and singing exams, as well as playing hymns at church services. In short, if he gets asked to do something piano related, the answer will probably be yes! Philip has accompanied the Bath Male Choir since the summer of 2016. Come to a concert click here for details. To add to his achievements, Grenville’s first novel was published in September 2015 shortly after returning from taking sell out Come and Sing workshops in Canada. Deep Harmony was the result of 4 years endeavour by Grenville writing (usually) whilst tucked away in the corner of a hotel bar in Countries across Europe surrounded by paper and post-its! The book received rave reviews and is now on sale with 25% of all sales going to Grenville’s Goldies charity, to support more daytime sing and smile sessions across the UK. Read about the loves and lives of Cornish choir The Verlis Singers in Deep Harmony … click here to purchase your copy on Amazon or Download on Kindle. Grenville enjoys the reputation of being 'Bath's Mr Music!' 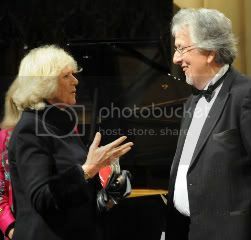 He received an honorary doctorate degree from Bath Spa University in 2012 for his contribution to community music and his Charity. In the same year he was presented to the Queen at a Buckingham Palace Garden party at the invitation of the National Lottery. His contribution to music has been recognised locally and nationally. In 2015 Grenville appeared again in a national newspapers Top 100 HAPPY List – recognising his work with the Golden-Oldies charity. He has appeared on National television working with Gareth Malone and was asked to lead a youth choir from across the West of England as part of the BBC Children in Need 2011 and 2013 appeal. He has also worked with Katherine Jenkins, Hayley Westenra, Aled Jones, Jamie Cullum, Lee Mead, Alfie Boe, Rhydian Roberts and Russell Watson. The Golden-Oldies Charity was started by Grenville in January 2008 with four fun singing sessions in sheltered housing community rooms in Bath and now has over 150 each week across England and Wales as Goldies CYMRU which Grenville launched in South Wales in November 2011. Grenville’s leadership of Goldies – with Sir Cliff as patron – sees him travelling all over the country and the website featured the recent launch of the charity in Silsden Yorkshire. There is a video from the launch on the charity website with the Lord Mayor of Bradford doing the twist! The Charity has attracted world-wide media coverage. Goldies is NOT a choir but it uses the popular songs of the 50s and onwards at its daytime sing and smile sessions for isolated older people and Grenville is anxious that whilst he is the founder, the charity now has an increasing base of volunteers, trustees, session leaders and supporters, without whom Goldies would not be able to develop. Bath Male Choir have sung for the Goldies charity on a numbers of occasions and 40 members joined Grenville to run the Bath Half in 2010. In 2015the boys from Bath travelled to Staffs as guests of The Heath Chorus helping to raise £1500 towards the development of the charity in the West Midlands. He was the only English musician working on a two year EEU project 2011 and 2012 with partners from across Europe and led by the acclaimed Fraunhofer Institute in Germany and the Austrian technology Board. They studied how music and other related therapeutic projects could enhance the lives of elderly people living in isolation. Back to the music where he started a series of Good Afternoon Choirs in May 2009 across the West of England for retired people. Since 2009 Good Afternoon Choirs now run in Bristol, Frome, Wells, Keynsham, Yate & Chipping Sodbury, North Somerset, Bath, Thornbury and Devizes. For 11 years he led Bath's Silver Ring Choir. In that time he trebled the membership and took the choir on concert tours to Europe, Canada and New Zealand. He left them to start THE Bath Chorus in January 2009 to start his own choir and over 150 people attended an open night. This Choir rehearses on Monday nights and they have performed at Wells Cathedral and on numerous occasions at Bath Abbey. They have a growing reputation and a busy schedule ahead. He also has the Wednesday evening Welcome Choir. This is a non-audition group rehearse every Wednesday evening at Southdown Methodist Church, off Rush Hill. Membership is getting close to 100 singers. Lee Mead was the guest at the Bath Male Choir 2011 sell-out annual concert. Grenville and Lee are pictured above. He lives In Bath and is a proud Granddad! Isaac is the son of Daniel and Rachel and Maisie is their daughter. Artur is the son of Kieron and Marianna and Melodie is their daughter, they live in Brazil. Laurie is Grenville's youngest son. A talented drummer, he graduated with hons in music at Bath Spa University and is a secondary school head of music and choir leader. He is married to Kerrie and they have two children Maisie and Freddie, the latest addition to the Jones family. For a number of years in the 80s Grenville sang in a barbershop group called Five-in-a-Bar, making records and appearing on many national radio and TV shows including The Cliff Richard Show and Blue Peter, but he’s lost the badge! Many of the arrangements sung by the quintet were his. During the Last Choir Standing series the BBC showed a clip of a very young GJ singing with Five-in-a-Bar on Blue Peter, and one of the interviews with Grenville on the show was in the Blue Peter garden! Grenville's background includes a number of years managing newspapers as well as a period working as a freelance for the BBC in Bristol. He built up his own successful PR and Marketing company in the 80s and 90s and also a magazine company publishing golf titles. A bad back has ended the chances of him winning the Open! Singing was always part of a Methodist home upbringing in Purton near Swindon. He used to have a tenor voice but G says that many years of choir conducting have strained his voice now to a poor bass.